I haven’t been getting very interesting items with the veggie CSA, which explains why I haven’t posted much about it. I did get a lot of napa cabbage, more than I had room for. 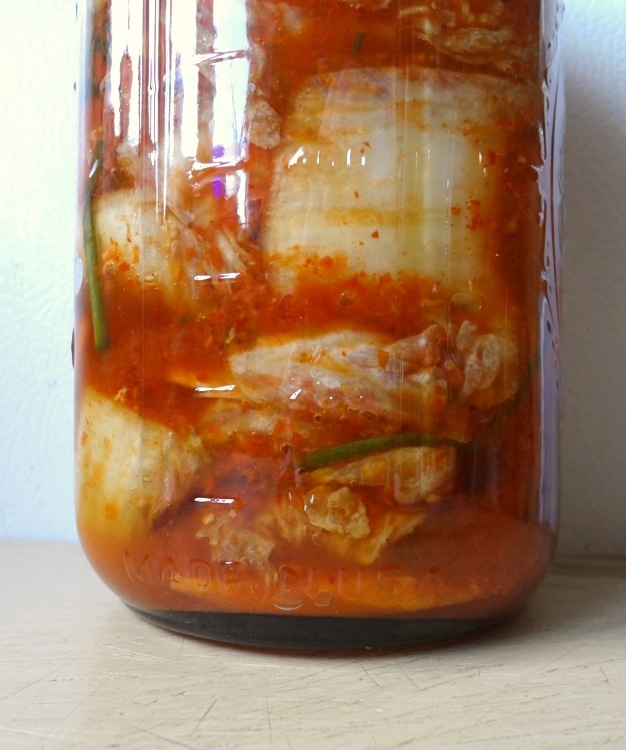 So, most of it went toward making kimchi. There’s no recipe – I made it without measuring anything. I should have used more ginger, but I was out. I made nearly 2.5 quarts. Now, it’s just sitting in my fridge. I might make pasta with kimchi tonight for dinner. I rather liked the way this came out. It’s been hot here in Boston this week, so on Sunday I made myself cook something that would last me a few days. First of all, this recipe won’t be for everyone. I like fresh mint and not everyone does. In fact, some people hate mint like I hate cilantro. I understand that. But don’t let the mint stop you. I think that it’s probably easily replaceable with basil or parsley. Saute the leeks and potatoes in some oil using a soup pot over medium heat. Cook until the leeks are softened, about five minutes, stirring frequently so that the potatoes and leeks don’t stick to the pot. Then add the chicken broth, zucchini, chickpeas, and (in my case) cayenne pepper to the pot. 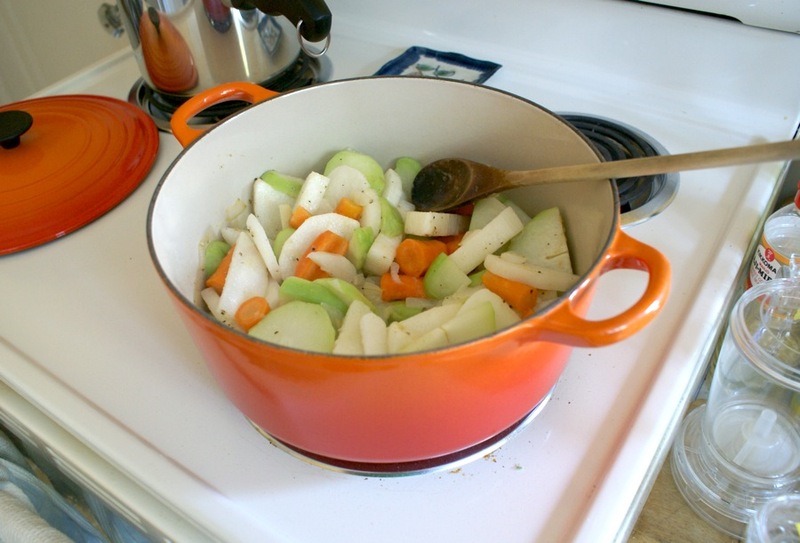 Bring to a boil, cover, turn down the heat to a simmer, and let it cook at least 20 minutes. You want the veggies to be soft, so don’t worry if it ends up being 30-40 minutes. When the veggies are done, remove from heat. Season with salt and pepper as you like. Add the mint. Add the lemon juice to taste (I only used a couple of teaspoons). Puree the soup. I have a stick blender just for moments like these… so much easier than trying to puree in a blender or a food processor. I originally left the skin on my veggies because there didn’t seem to be a reason to peel. I knew I was going to puree it all. I’m glad I did – it left nice flecks of color in the soup and kept it from looking boring. And that’s it. Done. For my purposes, it made three large bowls and one small bowl. I’ve been having soup and sandwiches for dinner for the last four nights. I haven’t had to cook a thing since. Too bad I’m all out. It’s still hot tomorrow. I guess I’ll need to cook something small.